Kristal Spencer and her father Peter Ruchs at their Williamstown property shed, where Winestains is based. Williamstown local Peter Ruchs has always been a passionate carpenter and all-round handyman, but he’s spent most of his life working as a winemaker at Adelaide Hills and Barossa Valley wineries. His career began as a 15-year-old at Chateau Yaldara in Lyndoch, where he quickly earned a reputation for hanging around visiting tradies to pick up the tricks of their trade. But it wasn’t until Ruchs reached his 50s that he saw an opportunity to combine his passion for carpentry with wine by repurposing discarded wine barrels into a range of sleek homewares and outdoor accessories. “He just came across these discarded wine barrels that were getting thrown out and thought he may as well do something with them,” Ruchs’ daughter, Kristal Spencer, says. “He started mucking about in the shed and came out with this surfboard-shaped cheese board that he made from a head of a wine barrel. From there, Spencer, a former graphic designer at a local newspaper, convinced her father to launch a homewares business in 2010, which they called Winestains. 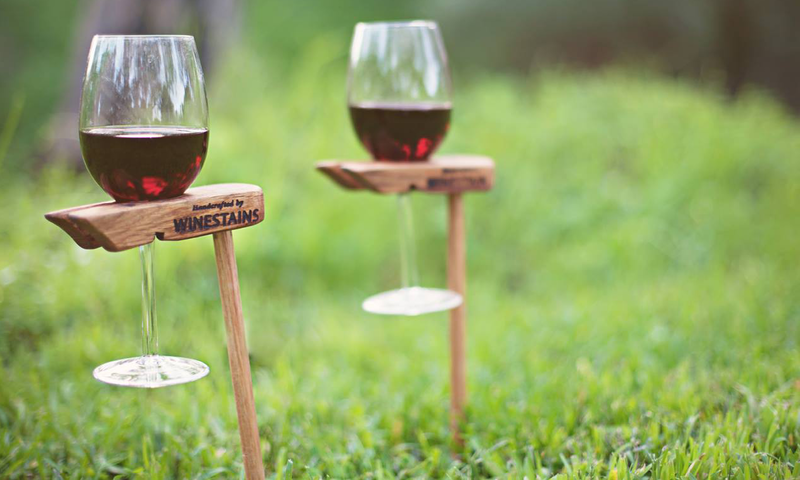 Winestains is best known for its cheeseboards made from discarded wine barrels. At the beginning it was a small-scale business operating at local markets, but the quality workmanship and unique colouring of the wood quickly drew bourgeoning interest. As demand has grown, so too has their range, and this weekend they will be operating a stall at the Bowerbird Design Market at Adelaide Showgrounds. “Basically, wine barrels are made from the top 20 per cent of French and American oak trees, so we’re really lucky to be able to work with that sort of timber,” Spencer says. “The winemakers have got all the flavours out of the barrel so they can’t do much more with it, but that’s where we come in and repurpose it with this quality timber. Added to the benefits of using discarded wine barrels is the cost – or lack thereof. Spencer and Ruchs maintain close contacts with winemakers in the Adelaide Hills and Barossa, who pass their wine barrels to the pair once they no longer need them. “When we first started, barrels were literally just being thrown out but now they’re a little bit harder to come by,” Spencer says. “Around 12 [to] 18 months ago they were quite scarce because barrels have about a five to six-year lifespan to them and about that time there was this shortage – a really terrible vintage – so the amount of wine barrels in use had gone down. Spencer and Ruchs have been working full-time with the business for the past couple of years and have contracted five retired carpenters to work part-time at the family shed. 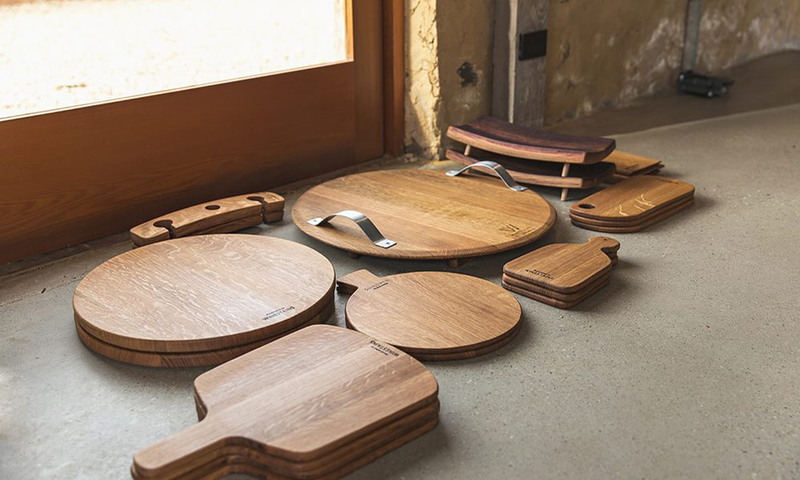 The product range has also expanded to include a range of cheeseboards, picnic accessories, decorative pieces, coasters and stands. “If I looked back and I saw what was going to be happening in five or six years it would be a little bit unbelievable,” Spencer says. “At the beginning, it was a pretty hard hustle where we were both working full-time jobs – me at a newspaper and Peter as a winemaker – and doing Winestains on the side. Winestains sells its products Australia-wide online, at local markets and through a growing number of stockists, including JamFactory, Wohlers Tanunda and the Barossa Valley Visitor Centre. The key to its success, according to Spencer, is the originality and history of the products. “People are just loving that whole reduce, reuse, recycle thing, and they love the fact each piece is a little bit different and has that Barossa feel,” she says. “They’ve got such a beautiful story behind them – made by Peter, who was self-taught – right through to the wood that’s had this past life as a wine barrel. Winestains will be selling its products at this weekend’s Bowerbird Design Market at Adelaide Showgrounds on November 23 to 25.